This paper examines key crisis management provisions of the IEA Agreement in relation to the interests of member countries in energy security cooperation' and considers ways these interests might be further served by altering the agreement. Two observations underlie both the motivation and thrust of this investigation. The first is that the potential benefits to members of energy security cooperation are likely to be substantial.' Thus, it may be assumed that TEA members have an incentive to find methods inside or outside the agreement for reaping at least part of these gains. Given these incentives, it is important to consider how potential gains from cooperation can be achieved in practice. 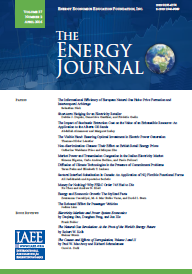 Published in Volume 7, Number 2 of The Quarterly Journal of the IAEE's Energy Economics Education Foundation.